Over at The Daily WTF, one of the authors, Remy Porter likes to add a certain amount of bonus content to the posts. Specifically – Remy’s articles always have a bunch of HTML comments with extra details or jokes, and clicking somewhere in the article produces unicorns. Well, there’s no sense in letting unicorns go unclicked! That’s why I wrote unremyfy, a script to display the HTML comments inline and highlight where you need to go to get unicorns. What a useful script! One change requested on the Skeptics Stack Exchange is to make the “rapidly changing” caveat on questions like this one more prominent. I liked the idea, so I wrote a user script in the mean time to do it. It adds a border around the right and bottom of the post, leading to the notification. This will work either in Firefox (with Greasemonkey installed), Chrome (with restart) or Opera. There are extensions for other browsers (GreaseKit for Safari, Trixie for IE), but I haven’t tested with them. Climate change not only causes shifts in the distributions of native species, but also allow invasive species to establish new populations. For example, many Caribbean species are taking advantages of warming temperatures, expanding polewards and invading into the south-eastern United States. Having established themselves, however, it’s not unknown for the invaders to come to pain. For example, in early 2010, the south-eastern United States experienced a particularly cold winter, which came to be known as “Snowmageddon”. After Snowmageddon, scientists found that the populations of several established invaders had crashed, in some cases been entirely wiped out. Curious, Dr. João Canning-Clode and his colleagues collected a number of invasive green porcelain crabs (Petrolisthes armatus) to study. They had three groups: one control group would be held at what would be a fairly mild winter temperature at the collection site, one group would go through a cold snap similar to that experienced in January 2010, and one would experience a cold snap which was a couple of degrees even more extreme. The results were striking. In the control group, 83% of the crabs survived the winter. In the Snowmageddon group, however, only 39% of the crabs survived – and the population that experienced an even colder snap was entirely wiped out. They also noted that cold temperatures caused the crabs to move around less – which, in the wild, would have probably caused them to be more vulnerable to predators and also make it harder for them to find their own food. The researchers figure that the occasional cold snap may have the effect of stopping invasive species in their tracks – devastating, if not wiping out the populations. However, as the globe warms, extreme cold snaps have been getting less frequent, a trend which is expected to continue. DeGaetano, A., & Allen, R. (2002) Trends in Twentieth-Century Temperature Extremes across the United States. Journal of Climate, 15(22), 3188-3205. Kodra, E., Steinhaeuser, K., & Ganguly, A. (2011) Persisting cold extremes under 21st-century warming scenarios. Geophysical Research Letters, 38(8). Bird tapeworms (Schistocephalus solidus) have three distinct life stages. First, they infect copepods (tiny crustaceans), such as Cyclops strenuus abyssorum. The copepods are eaten by sticklebacks – in this case, the three-spined stickleback, Gasterosteus aculeatus. The sticklebacks are then eaten a bird, in which they breed and produce eggs with which to infect the next generation of copepods. In order to be infectious to a bird, the tapeworm larvae must grow to a size of at least 50mg. That being said, the bigger the better – larger parasites are far more fertile, producing many times more eggs – which are also larger. Larger parasites also make their hosts less able to breed and more likely to be eaten by a bird. Parasites infecting organisms which do not control their own body temperatures (such as most fish) are more likely to be directly affected by climate change – a parasite infecting a warm-blooded mammal, for example, can rely on a temperature-controlled living space. To test what impact temperature would have on how infective the tapeworms were, Macnab and Barber (2011) kept two populations at different, static temperatures, within their normal temperature range – 15°C and 20°C respectively – and fed half of each population infected copepods (the others got non-infected copepods). Temperature, they found, did not affect the likelihood that a fish eating an infected copepod would be infected – in both cases, about half of the exposed fish were infected. However, they found that the tapeworm larvae grew much faster in the warm-water group. 8 weeks in, every tapeworm larvae in the warm-water group had reached the 50mg size necessary to infect a bird – whereas none of the larvae infecting the cooler group had. In fact, in the warmer population, the average size of the tapeworms was twice the size they needed to infect a bird. They estimate that this difference would allow each parasite to produce at least an order of magnitude more eggs than in the 15°C group – almost 200,000 eggs each as compared to 12,000. They also showed that once infected, the fish with infective worms preferred warmer water. A different population of infected and non-infected sticklebacks were introduced to an aquarium with cooler (~15°C) and warmer (~21°C) compartments, with an intermediate-temperature (~18°C) linking chamber. The fish were then allowed to settle in the intermediate chamber and watched for three hours. The non-infected fish, as well as those with parasites too small to infect a bird, tended to stay in the intermediate chamber. However, fish with large, infective parasites preferred warmer waters, with a thermal preference over 1°C warmer than the other groups. Although such a pattern might be perhaps be explained by an attempt on the part of the sticklebacks to increase the effectiveness of their immune system, the authors suggest that the tendency of fish bearing larger-but-noninfective parasites towards lower temperatures is more likely motivated by the tapeworms. Larger parasites would have increased energy demands, increasing the likelihood that the host would starve – and the parasites with it. When the parasites are large enough to infect a bird, however, all bets are off – the priority is to get large and to get eaten. Previous studies on these species, such as Barber et. al. (2004), have found that, once a stickleback was infected by a sufficiently large parasite, the parasite would impair the fish’s abilities to flee predators. Fish infected by such parasites were less likely to make any evasive behaviour, less likely to reach cover, less likely to perform “staggered dashes” to prevent a predator from anticipating where they would move next and more likely to try and “evade” predation by simply slowly swimming away. Fish that prefer warmer waters are probably going to end up at the surface and at the edges of lakes – right where they’d be more vulnerable to bird attacks. There is also potential for a positive feedback relationship – fish infected by larger parasites prefer warmer waters in which the parasites grow faster and the fish are more likely to be consumed by birds. It seems that one beneficiary of a warming climate is the tapeworms. Some like it hot (if they’re riddled with parasites) – Not Exactly Rocket Science. Be sure to check out the comments, one of the authors has added information. Do Cosmic Rays Cause Global Warming? How do you make a cloud? Well, first you start with an aerosol particle, a small particle around which the much larger cloud condensation nuclei (CCNs) can condense. It takes a large CCN – at least 100 nanometres in size – for water vapour to be able to condense from water vapour. Clouds are made up of many CCNs with water condensed on them. Clouds can reflect sunlight back into space, cooling the Earth – but they can also reflect heat back to Earth, warming the Earth instead. The total cooling effect of clouds is about 44W/m2, contrasted with about 31W/M2 of warming from them reflecting heat back to Earth – a net effect of about -13W/m2 (Ramanathan et. al, 1989). A new paper, Kirkby et. al. (2011), published by scientists at CERN claims to shed light on the role of cosmic rays in the formation of these aerosol particles. Cosmic rays are mostly the remnants of atoms which have been accelerated to near the speed of light, along with some more exotic particles such as stable antimatter. Most cosmic rays reach such speeds while bouncing around in the magnetic fields and remnants of supernova, though some reach even higher energies through not-yet-fully-understood processes. The sun’s magnetic field diverts most cosmic rays away from the Earth, so the solar maximum is the low for cosmic rays, and during the solar minimum is when we get the most cosmic rays here on Earth. As they pass through the atmosphere, they collide with gasses, donating their energy and ionizing the molecules. Kirkby et. al. used a particle accelerator to create analogs to cosmic rays, ionizing the gasses. They found that this increased the formation – the “nucleation” – of small aerosols – nanometre sized particles – by a factor of 2-10. They also showed a much larger – 100 to 1000 times – increase in nucleation from the presence of ammonia in addition to sulphate. It remains the case that they observed far more nucleation than in previous lab studies, it was still several times lower than is observed in the atmosphere. Their setup only considered small, nanometre-sized particles – it was in principle incapable of producing larger ones. No doubt, future experiments, including future work by these same scientists, will investigate whether similar increases in the formation of larger, potentially cloud-forming, particles are found. However, other studies have found results that cast doubt over whether this will be the case. For example, Snow-Kropla et. al. (2011) found that the observed variation in cosmic rays made less than a 0.2% difference in the concentration of 80 nm particles. They saw a larger increase (1%) in 10 nm particles, suggesting that the impact of cosmic rays falls off as you look at larger particles. Pierce & Adams (2009) find similar results, and suggest that this could be because of a lack of condensable gasses that would allow the particles to grow larger – that it’s not the lack aerosol particles limiting the growth of potential cloud condensation nuclei. If so, it doesn’t matter how many aerosol particles there are about, so far as CCNs are concerned – they are limited by a different factor. It would certainly be possible for the results of a future experiment to contradict these results – and it would be interesting to see how the question was resolved. An increase in aerosol nucleation increases the concentration of large cloud condensation nuclei (though it’s not out of the question, we’ve already seen that it has been contradicted by other studies). That an increase in CCNs increases cloud cover (this, at least, seems plausible). That there is a downwards trend in cosmic rays (which would decrease nucleation, which may reduce CCN formation, which may decrease cloud formation). So what are cosmic rays doing? Well… not much. The data just doesn’t contain the sort of decline that would be necessary for any possibility that cosmic rays could be the cause for global warming. Cosmic rays seen by monitoring stations in Climax, New Mexico and Oulu, Finland. Shown as the variation from a 1970-1999 baseline. 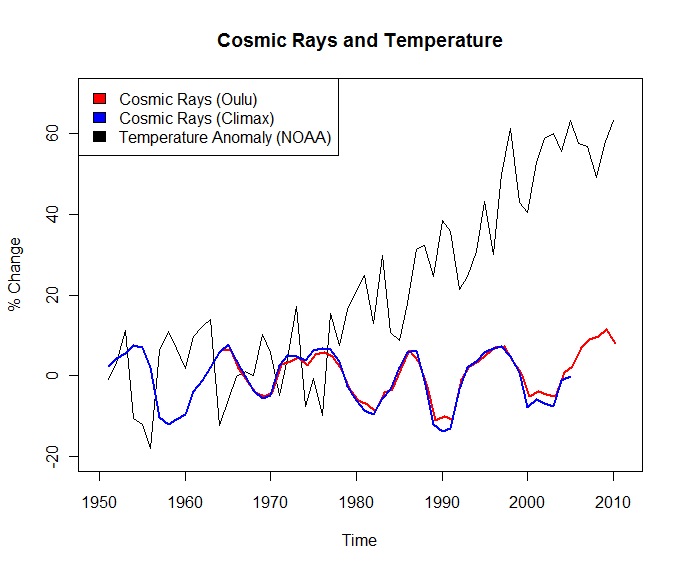 Many in the media jumped to the conclusion that cosmic rays were affecting the climate. Lawrence Solomon wrote a hyperbolic article claiming that the paper proved absolutely, beyond a shadow of doubt, that cosmic rays were responsible for all the observed global warming. The International Business Times claimed that anthropogenic global warming had been disproved. James Delingpole has got a wonderful conspiracy theory going. One must wonder why people so “sceptical” about the well-established link between greenhouse gasses and global temperatures would be so quick to jump to conclusions without even a correlation. No such conclusions are supported, or even suggested, in the paper they each claim to be writing about. 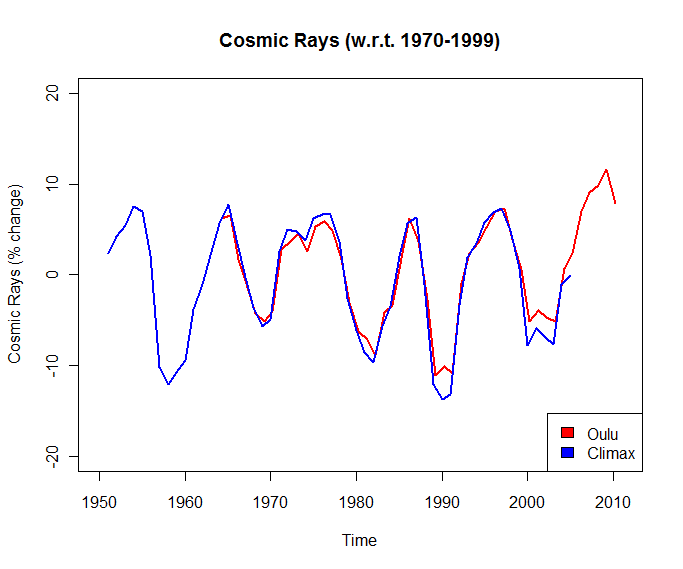 Cosmic rays as above, plotted alongside NOAA’s monthly global index (which uses 1901-2000 as a baseline).